Why are home prices so high? Seattle has 2nd-lowest rate of homes for sale in U.S.
Only the San Francisco Bay Area has a tighter housing market than Seattle, and all the competition here is pushing prices higher than ever. Why is it so expensive to buy a house in Seattle right now? Everyone seems to have someone to blame: Amazon, priced-out Californians, foreign buyers, developers tearing down old homes to build huge new ones. But people in the real-estate industry point to a much broader problem: No one is selling their house. But the new data shows just how much fiercer the competition is here compared with other hot markets around the country. The local region is the 15th-biggest housing market in the country. Yet there are 36 major U.S. markets that are smaller than Seattle but had more homes for sale, including Austin, Denver and San Diego. Portland had about the same number of homes on the market as Seattle despite being half the size. Chicago and Miami, while bigger than Seattle, each had about nine times more homes for sale than Seattle. You’d think homeowners would be eager to sell and cash in on their big profits: Home values in Greater Seattle have soared about 60 percent in the last half-decade. However, brokers say homeowners don’t want to sell because they don’t want to have to turn around and buy another pricey home. Those homes that do hit the market are often sold before the “for sale” sign is staked into the front yard. Seattle is the fastest home market in the country, with the average home selling in just 15 days, according to Redfin. 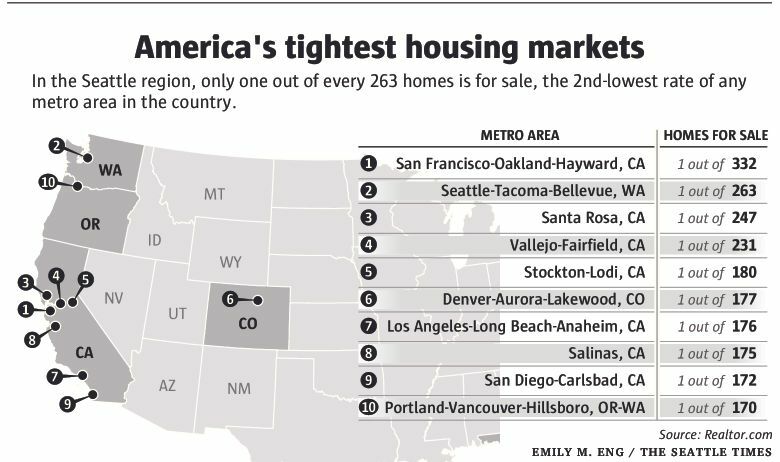 That’s despite the fact that the region has the second-most bidding wars in the nation, again behind the Bay Area. While the lack of housing “inventory,” as it’s known, has been a growing problem for years in and around Seattle, the pickings are especially slim right now. The number of homes for sale in King County last month hit its lowest point on record: just 1,600 houses were on the market, mostly in the suburbs, down from 7,400 houses six years prior. That doesn’t come anywhere close to meeting the demand. Yet even the small number of homes doesn’t tell the whole story. A disproportionately high number of houses on the market are luxury homes, because those typically take the longest to sell. As of this week, there were only 81 houses in all Seattle available for less than half a million dollars, and some of those are auctions and foreclosures, according to Zillow. The vast majority are on the northern and southern edges of town. Seattle has only about 260 homes for sale under $1 million. The problem has sparked stressful bidding wars, shifted home hunting into a marathon endeavor that can take six months to a year, and prompted families who set out with a long checklist of must-haves to just settle on whatever home is available. But its biggest impact is on prices. Supply is dwindling at a time when demand keeps rising with job and population growth, and renters keep getting fed up with pricey apartments. For the story to change in 2017, the region would need a big turnaround. 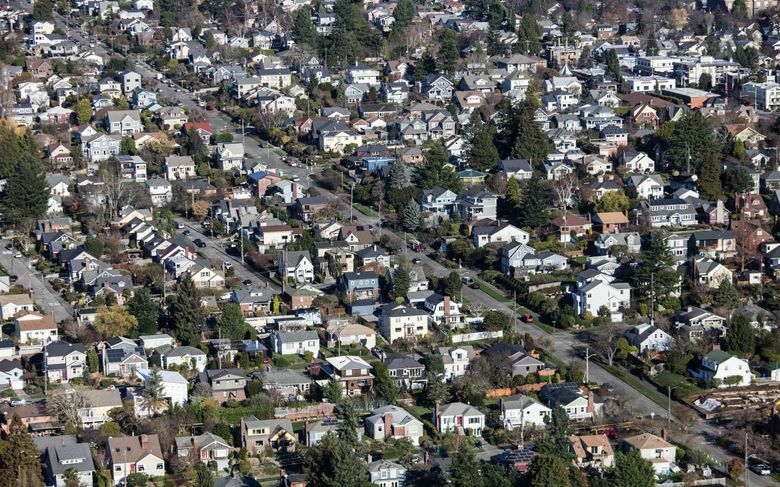 Seattle’s inventory dropped 13.4 percent last year, the third-most among the top 20 markets.